This Sunday in church we sang a popular new song called “The Great I Am,” and as I sat there pondering this line, over and over again, I was overwhelmed with the reality of God’s sovereignty. It’s something we kind of know all the time — God is sovereign; God is in control — we say these things all the time. But what really hit me at this moment was what that means for me right now. He chose to give me a child with a speech disability. Do you know how easy it would be for God to put speech in her mouth? For goodness sakes, he created the entire universe with a word. He could easily give Sophie words. Easily. Yet, he has chosen not to. There’s both a great deal of frustration and a great deal of peace for me in this. The frustration is of course, “Why, dear Lord, when it would be so easy for you, will you not allow my child to speak?” But the peace is right there, too, assuring me, “Rest easy, God has chosen this for you.” There’s a great deal of assurance for me in knowing that God has chosen this for Sophie, for me, for our family. That doesn’t mean I have to like it all the time, but my feet are firmly on the path God has given us. This might seem like an odd time for me to be struggling with her speech delay, given that she has finally begun producing some recognizable sounds — so sweet! — but, for some reason, it’s been one of those moments for me when I am feeling down. Maybe it was the upcoming genetics appointment, maybe just a lack of sleep, who knows. But some days this week it has been really hard to accept her situation. And just when I think I’ve finally crossed the bridge of acceptance and gotten my feet onto firm footing, I feel myself swinging in the middle of that rickety rope bridge again. My child is different. Her life will be different. It’s been that kind of week. Even though my heart has felt heavy this week, I can report that our genetics appointment actually really went very well. These doctors are in the perfect profession. Sophie is terrified of doctors after all that she has been through. But these doctors were so good with her. Normally she screams if the doctor tries to listen to her with the stethoscope. And you might as well forget about looking in her ears. She has to be restrained for that. But these doctors were awesome. I knew we were going to be good when the first doctor turned to Sophie and said, “Do you want to play a game with me?” And Sophie responded with a nod. She let the doctor pick her up, and she held the stethoscope to her own chest. Towards the end of her exam, the doctor asked her if she wanted to look for the bunnies in her ears, and again, Sophie agreed. She stood still, on her own, and allowed the doctor to look in both of her ears. She enjoyed the game thoroughly! What a blessing to see the loving hand of our Father in selecting these doctors for Sophie, and in gifting them with both knowledge and a love for and connection with children. Amazing! We will see them again in six months to monitor Sophie’s progress. 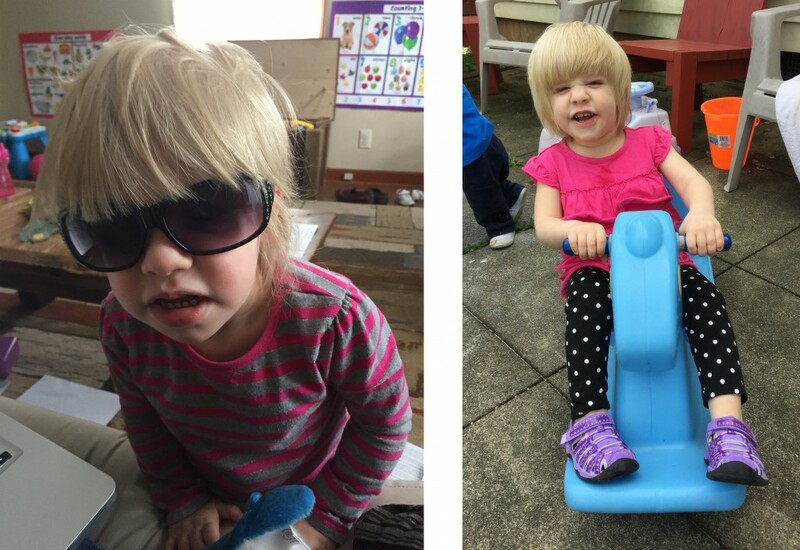 Nothing about Sophie’s differences is profound enough to point to a specific syndrome, though the doctor did feel she had some indicators for a possible genetic mix-up, minor as it may be. So it’s more wait and see. And we’re ok with that. After genetics, I found myself pondering the weight of Sophie’s future, and I felt God’s gentle reminder to take it one day at a time. All I need to be able to do is accept the life God has for us today. Just for today. My daughter is a peach. She makes me laugh every day. Her ability to communicate through sign increases every day. And so I can accept where we are today. And I can trust God for the future. I can trust him for the rest. After all, he is The Great I Am. I used to really hate poetry. Even when I was studying English in college, I never got excited about assigned reading that included poetry. I didn’t get it. Too many symbols. Too much flowery language. But there is one poem that I have always liked: Robert Frost’s “The Road Not Taken.” This poem speaks of a traveler who sees two paths, but, being only one person, he can only travel one road. In the end, he concludes, “I took the one less traveled by, and that has made all the difference.” Now there’s poetry that I can understand. How I see it is that we’ve got two paths we can be on. We can be on our own path that we’ve chosen, doing our own thing, or we can choose to be on the path that God has for us. It is the lesser traveled path to be sure, but I believe, like the traveler, that it will make all the difference. I would not have chosen for myself a child with a speech disability. But God in his wisdom has chosen this for us. So don’t be sad for me or for Sophie, don’t pity my family. We are squarely in the middle of God’s path for us. And that is a good place to be. Wherever you find yourself on your path, I imagine there are obstacles, challenges, losses, trials that you perhaps would not have chosen for yourself, could you have seen all the way down the path. But God has chosen to allow these things in your life. So what are you going to do with them? Join me in putting one foot in front of the other, navigating that rickety, swaying bridge of acceptance. Accept today. Trust The Great I Am for tomorrow. One thing I could never seeing myself do was “child care”. One day there I was looking after a little blonde sprite, because I love her mom so much. Sure, I was scared, that I was being entrusted to care for this very special girl. This loving mom had written everything down, and the times we were supposed to do them. Well, needless to say, after ten days or so, I asked Sophie if she wanted to leave “The Rules” on the fridge? She clapped her hands and we created our schedule. It wasn’t THAT much different and we both began to discover our bond and how we could work things out. With walks to the pond and swimming in the pool, she started to become so independent in her dealings with each day. She would lie on the floor with Sebastian, each of them taking a turn to “speak” also, picking eggs from “the girls”. One of the best moments was when our small group had a bon fire at our house. Sophie took the other children to show them HER world here and how she ran it. She has come so far since that first day in August 2013, it makes my head spin. YES, she is our Granddaughter, not by blood, but by bond. I wouldn’t change a thing about her or our time together. Now, she tells us what to do and when to do it. Maybe not verbally…but we know what she wants and how it must be done. She has a strong personality and is not afraid to use it. I thank God every day for bringing this family into our lives. I don’t say this because we taught her how to do things. She has taught us so much and we have loved every minute of this ride. God allowed her to come into our lives for a reason, of which I don’t know yet. Maybe to bring a calm to my soul or a smile to my lips. The reason doesn’t matter. I am certain every day that God brought our families together for a reason! You and Mick are so wonderful for Sophie and for us! I’m thankful that God chose you two to be on this journey with us! Thank you for the reminder <3 He IS the Great I Am! I’m glad to know that I’m not the only one who sometimes wrestles with acceptance. Thanks for always encouraging me. I pray for you often with the physical trials that you must endure this side of heaven! Hugs!